India and Indonesia on Friday "unequivocally condemned terrorism in all its forms" while agreeing to work together to harness the potential of the Indo-Pacific region. "We unequivocally condemned terrorism in all its forms, irrespective of its motivation and origin," External Affairs Minister Sushma Swaraj said while addressing the media after the fifth Joint Commission meeting of the two countries which she co-chaired with Indonesian Foreign Minister Retno Marsudi here. "We expressed our strong opposition to any selective approaches to deal with this global menace, and called upon all countries to stop providing state sponsorship of terrorism and prevent their territories being used for establishing terrorist safe havens," she said in a veiled reference to Pakistan.She said that during Friday's discussions, "there was clear recognition that India and Indonesia, as two close maritime neighbours, are natural partners in peace and prosperity". "We are two major countries in the Indo-Pacific region. This region is among the most dynamic regions in the world. We agreed to develop synergetic relationship to harness the potential of Indo-Pacific region and to meet the challenges that the region faces." This assumes significance given China's aggression in the South China Sea and its increasing influence in the Indian Ocean region.Sushma Swaraj said that Indonesia, as one of the largest countries with a diverse democracy, and the biggest economy in the Association of Southeast Asian Nations (Asean) region "has a critical role to play in evolution of the new security architecture in the Indo-Pacific region".India has been increasing its engagements with the 10-nation Asean regional bloc under New Delhi's Act East Policy.As the biggest country in the Asean region with the largest economy, Indonesia is an important partner for India, including in trade and strategic matters. 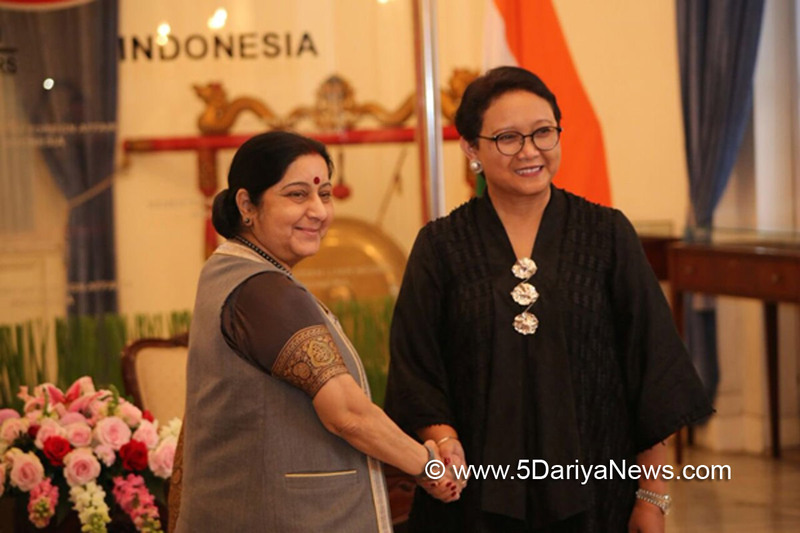 Stating that the Indonesian Foreign Minister conveyed her country's determination to play its part and make due contributions to the ongoing efforts to strengthen rule and respect of law, Sushma Swaraj said: "I welcomed it and conveyed India's commitment for peace, security and development in the region. "She also said that both sides agreed to enhance consultations and cooperation on maritime issues including on United Nations Convention on the law of the Sea (Unclos) with a view to strengthen rule of law and to ensure the freedom of navigation and safety of sea lanes of communication. Stating that Marsudi expressed her appreciation over the increase of Indian tourists to Indonesia, the Indian minister said that both sides agreed to expand civil aviation links to further enhance bilateral economic and tourism ties.Sushma Swaraj said that she expressed the importance of addressing the high trade deficit that India has with Indonesia and thet she conveyed that the best way to address this issue is not to restrict trade but to increase it.India-Indonesia bilateral trade has increased from $4.3 billion in 2005-06 to $ 17 billion in 2016-17. "We agreed to work together for a balanced and sustainable trade by providing greater market access, both in goods and services," Sushma Swaraj said in her address. She said both sides also discussed the increasing demand for skill development "in both our countries given that we have a large proportion of young population". "I conveyed that India will continue its skill development assistance in the form of short term training program and scholarships. "Sushma Swaraj also expressed her appreciation that Indonesian President Joko Widodo has accepted Prime Minister Narendra Modi's invitation to join the Special Commemorative Summit to be hosted by New Delhi on January 25 to mark the 25th anniversary of the India-Asean Dialogue Partnership. Leaders of all 10 Asean nations are expected to participate in the Summit and together attend this year's Republic Day celebrations the next day.Earlier on Thursday, Sushma Swaraj arrived here from Thailand on the second leg of her three-nation tour to southeast Asia.Prior to participating in the Joint Commission meeting, she called on Indonesian Vice President Muhammad Jusuf and engaged in discussion on "strengthening our strategic partnership", according to External Affairs Ministry spokesperson Raveesh Kumar.On Saturday, Sushma Swaraj and Marsudi will jointly inaugurate the Asean-India Think Tanks Forum before the Indian minister leaves for Singapore on the third and last leg of her tour.